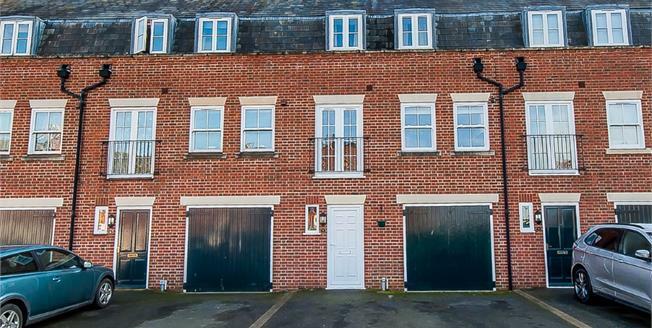 Built in 2008, this three bedroom mid-terrace townhouse offers modern accommodation over three floors. To the ground floor there is a utility room and shower room as well as access to the integral garage. The first floor has a large kitchen diner and lounge, both with Juliet balconies, along with the family bathroom with modern white suite. The second floor offers the master bedroom with en-suite, Juliet balcony and access to an outside decked balcony, as well as two further good sized bedrooms. Externally there is off road parking and a fully enclosed, low maintenance rear garden. Double glazed window to rear. Having a single bowl stainless steel sink and drainer unit, space for washing machine, space for washer dryer. Radiator, ceiling light point, power points and wall-mounted gas fired central heating boiler. Comprising three piece suite of low level WC, single enclosure shower cubicle with wall-mounted thermostatic shower and pedestal sink. Radiator, ceiling light point and extractor fan. Having up and over door to front and an integral personnel door to rear leading to entrance hallway. Double glazed window to front. Having a range of fitted wall and base units, single bowl stainless steel sink and drainer unit, integrated electric oven, integrated four ring gas hob with over hob extractor, space for fridge/freezer. Radiator, ceiling light point, power points, tiled flooring and Juliet balcony with French doors to front. Double glazed window to rear. Radiator, ceiling light point, power points, TV aerial point and Juliet balcony with French doors to rear. Comprising three piece suite of low level WC, panel bath with mixer tap over and pedestal sink. Heated towel rail, ceiling light point, extractor fan and shaving point. Double glazed window to rear. Comprising three piece suite of low level WC, single enclosure shower cubicle with wall-mounted thermostatic shower and pedestal sink. Heated towel rail, ceiling light point, extractor fan and shaving point. Offering outside seating and views over the River Witham waterway. Double glazed window to front. Radiator, ceiling light point, power points and built in double fronted wardrobes. To the front of the property there is a driveway providing off road parking for one car and access to an integral garage. A pathway leads behind all of the properties in the row and gives access to a low maintenance garden that is laid to gravel, as well as having a pathway leading to the rear door on the ground floor.